The Castelli di Jesi are most famous for the white Verdicchio wines that are produced in the hills around this series of fourteen beautiful hilltop Castles, each surrounded by a town of the same name. While this area produces some notable red wines of the Rosso Piceno appellation, one of these ‘Castle-towns’, Morro d’Alba, earned DOC status in 1985 for their own red wine, the Lacrima di Morro d’Alba. The Lacrima grape is so ancient in the Marche that its origins remain a mystery. The name, Italian for tear (as in what one cries over spilt Lacrima di Morro d’Alba) is believed by some to come from the tear-like shape of either the cluster or the berry itself, while others claim its name comes from the fact that the berry bursts easily, and thus seems to be crying. Lacrima wines traditionally were light, sweet wines, but recently some tremendously perfumed, dense and complex wines are being made. Lacrima di Morro d’Alba was nearing extinction in the early eighties, as demand for the wine was rapidly losing ground to the more popular Montepulciano-based wines of the Marches, but all this changed with the arrival of DOC recognition. Growers suddenly felt inspired to justify their status, especially since the recognition also brought new demand for the wine. This new burst of energy was accompanied by a new approach to viticulture throughout Italy. As was happening in many regions, denser spacing in the vineyard and a reduced yield per vine produced wines of greater character and balance than ever was thought possible from the ‘lesser grapes’ of Italy. 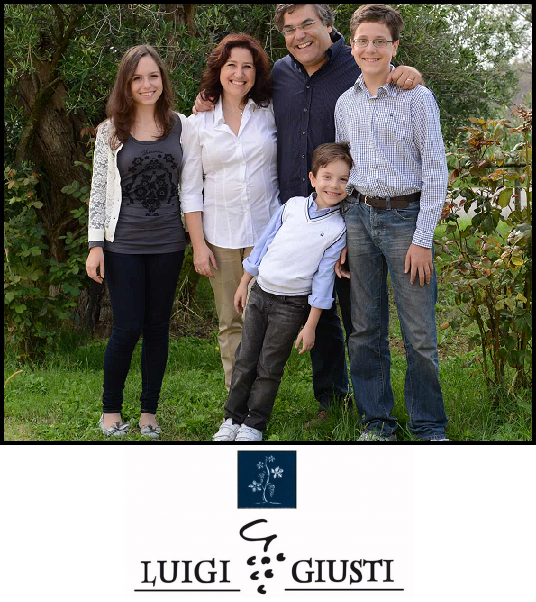 Luigi Giusti began growing grapes in 1965 in the town of Castelferretti, which lies just a few kilo meters off the Adriatic coast, just beyond the northeastern fringe of the Lacrima di Morro d’Alba appellation. While Luigi strove through the seventies and into the eighties to innovate the vineyards and winery for his two sons Piergiovanni and Filippo, he passed away in 1987 and thus never had the chance to really see the fruition of his dreams and the renaissance of the grape he worked with for so many years. In 1991 Piergiovanni and Filippo decided to aggressively pursue a renovation of the property, bringing it into line with modern viticulture techniques. While the Castelferretti cellar is still used for the sale and aging of bottled wines, in 1997 they bought a new cellar in Montignano, within the DOC boundaries, as is required by the Lacrima di Morro d’Alba disciplinary code, and filled it with state -of-the-art equipment. In 2000 they enlisted the assistance of enologist Giancarlo Soverchia, a specialist in the traditional grapes of the Marches. The Lacrima vine currently covers about 100 hectares of vineyard in the Morro d’Alba DOC. Lacrima di Morro d’Alba, "Rubbjano"
Lacrima di Morro Rosé, "Le Rose di Settembre"